"DETOURS" is a travel series by The Hop Review. Being a weary traveler almost always calls for a reward in the form of a pint at the end of the day. Here, we document those beer breaks–as we travel the U.S. and beyond–with quips, photographs and Q&As. It’s been a few years since we last formally featured this sour-focused brewery, when we originally interviewed Une Année founder, Jerry Nelson in 2014. So, we sent contributor, Michael Hubatch, to their ‘new’ suburban Chicago location to revisit the brand. I was hesitant to make the trek up to Niles, Illinois to visit Une Année, especially for a style of beer I have yet come to love… But after my recent visit, that may all change. After hearing enough of my friends rave about the brewery’s sours, I was somewhat surprised to find that they also brew pastry stouts and IPAs under their ‘Hubbard’s Cave’ label. Knowing this, I wasn’t terribly worried about having to hide my possible displeasure from the sour lovers if my palate was out of its element. I’m used to driving up to breweries in industrial parks and the like, and so that’s partly what I had pictured in my head for Une Année. 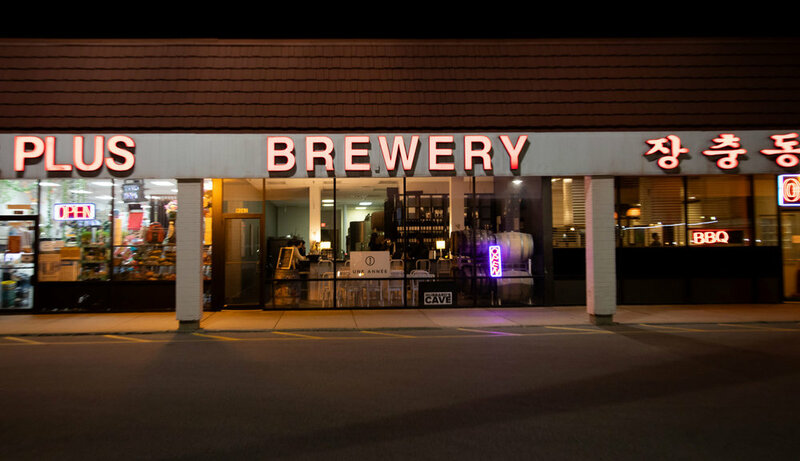 But the brewery and taproom sits in an unassuming strip mall with a bright stock-looking sign that simply says ‘brewery.’ I was greeted at the bar by taproom attendant, Paul, who offered up some suggestions. His first suggestion was the No Regrets Mosaic, a dry-hopped American wild ale fermented with limes, but I passed and opted for his second choice, the classic Framboise. With an opaque, reddish-pink color that reminded me of Kool-Aid, the Framboise was true to its name. It had a medium tartness upfront as expected, but then led to a surge of fresh raspberries. Maybe I’ve bored myself with other styles or maybe it was just Tuesday, but as a ‘non-sour beer guy’, this was fantastic. Then, I started wondering why I’d put off sours in the first place. Was it the tartness? Was it the complexity of it all? How could I have pushed aside such an old-school style…so easily? With the Une Année Framboise, the tartness dissipated quickly and left a raspberry flavor that would be hard to forget the rest of the evening. Both Une Année and Hubbard’s Cave beers are brewed just a few feet away from the taproom bar which certainly makes it a cozy affair. But there is plenty of room at and around the bar to enjoy the visit with a few friends. The décor is sleek, true to the brand’s black and white aesthetic and, more importantly, their beer list is quite extensive. With so many choices, you could easily come in to have an ‘Une Année’ night or a ‘Hubbard’s Cave’ one. As the taproom began to fill up, I decided to sample the other side of the brewery’s approach. The Hubbard’s Cave selections were, as expected, drastically different from the more delicate Framboise and other sours on the list, but none the less satisfying. The Fresh IIPAs I had were both imperials with the V7 being my favorite with a nice juicy texture and distinct flavors of tropical fruit. Their Bananas Foster pastry stout had a noticeable profile of the namesake fruit with notes of maple, vanilla, and dark chocolate. The hefty alcohol content made the finish taste of burnt bananas which, surprisingly, I liked. Though the IIPAs and Bananas Foster were solid beers that were right in my wheelhouse, I could not shake the want for another Framboise. The feeling was almost like my addition to hot sauce; the more I had of it, the more I wanted it, despite its polarizing flavor profile. I started thinking about food pairings and what dishes I could make with my sous-vide, but after opting for a taste of their Kriek–another Lambic with Morello cherries–the upfront sourness did bring me back to reality; the reality that I needed to continue to work on my palate and no longer dismiss sours so easily. It was a great first experience with the brewery, which helped put sour beer back on my radar. I look forward to going back and finding beers I can rotate into my weekly pick-ups. Framboise Lambic [6.5%] – Its tartness is all up front that subsides to a ton of raspberry flavor. Simple and to the point. Bananas Foster Imperial Stout [12%] –A powerhouse of a stout made with cinnamon, maple, and vanilla. Its dark chocolate notes compliment the bananas very well and left a finish of burnt bananas. Photographed & authored by Michael A. Hubatch, contributor for The Hop Review. Hubatch is a writer and photographer based in Chicago. He has previously covered the beer scene in Las Vegas, NV, Nashville, TN and Chicagoland for The Hop Review. Read the rest of the DETOURS series as we highlight unique places to drink across the world. with Une Année founder, Jerry Nelson, here.